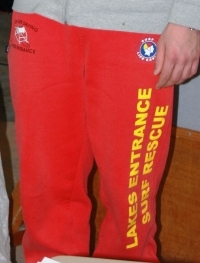 Red Surf Club patrol trackpants. Suitable for wear while on patrol for the colder days. AVAILABLE TO PATROLLING MEMBERS ONLY. AVAILABLE TO PATROLLING MEMBERS ONLY. Lycra comes in S/M or M/L. Please give size at order page.